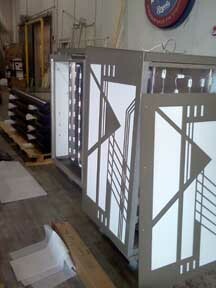 Star Signs has been hard at work cranking out quality custom signage for clients across the Midwest and beyond! As the temperature has increased, so has our workload, and we've been happy to have the opportunity to produce signage for University of Mary-Hardin Baylor, Lousiana State University, and Unity Village in Kansas City, to name a few. While we love to share what we've been working on and show off all of our latest projects, we've just been too darn busy to blog! Keep an eye out for new posts--we hope to get some great photos of our latest installs and share them in the very near future. In the meantime, check out the progress photos for the super-chic art deco light fixtures which Star Signs recently produced for the Kansas Leadership Center!